How to choose a good development center? Baby grows, he develops new needs. He reaches out to peers. Toys and books, which are at home, already fed. Even mother would like to take something useful with him. 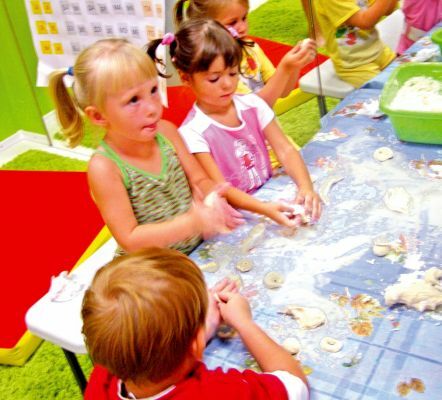 The kindergarten is too early; it's time for developing center. Teachers make out the ability that your baby has, tell how to organize a class with him the best way. Here, the child will be helped to raise self-esteem, to develop interest in cognitive activity. A good center can be a real lifesaver for moms, if they have no one to ask for help. Group of short-term stay for the kids who do not attend kindergarten, let mom find time for herself - for example, on a visit to the doctor or hairdresser. - Socialization (play with peers and adults, psychological training in the form of a game, etiquette, etc.). As we can see, these areas often overlap, because, for example, dancing - is not only exercise, but also an incentive for the aesthetic development and molding of the clay helps the creative development and training of fine motor skills, fine finger movements. Teaching mathematics is closely bordered by the development of logic, language development - from learning to read. How to choose a center? If the child is small, it is best to focus on those groups that are in walking distance from the house. Talk with other mothers of children in the playground; ask for advice from fellow parents of kindergarten group. Go to the centers located nearby, talk to the administrator, and meet with teachers, which should lead interesting courses. You'll quickly see how you are satisfied with the atmosphere and personality of the teacher.